Triton AS2000XT €480.00 supplied & Fitted. Replace your old/broken Triton as2000 or Triton AS2000x with a new Triton AS2000XT for only €480.00 or €460.00 when you Book & Pay Online. Thermostatic Power Shower Chrome / White offering all of the benefits of the AS2000XT it also boasts fully thermostatic control. Making sure that if someone turns the water on elsewhere in the house then your perfect showering experience stays that way. The AS2000XT gives you a different way to control your ultimate power shower with independent flow and temperature controls, and a separate start/stop button, which means that once you have set your perfect shower you need never change the settings. Variable rub clean sprayhead: 5 position rub clean sprayhead. Automatic shut down if the hot or cold supplies fail. Easy grip independent flow and temperature controls. Integral pump delivers up to 14 litres per minute. Numbered temperature dial for easy temperature selection. Adjustable maximum temperature stop – prevents the temperature being accidentally being turned up too high. 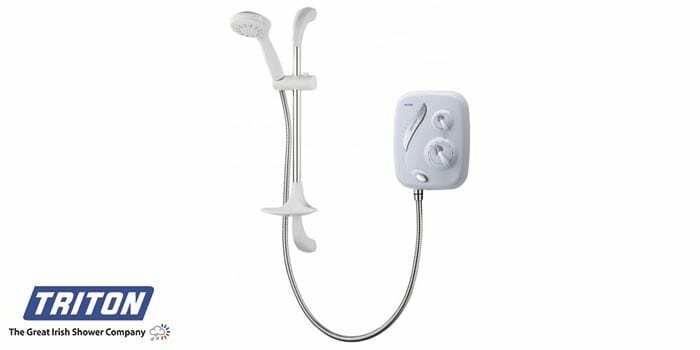 For a new install of a Triton AS2000XT Shower to current standards and regulations, Supplied & Fitted €900.00 or €880.00 when you Book & Pay Online. We send out an Electrician & a Plumber so you know the wiring & plumbing are up to standard.